In Venezuelan cuisine, an hallaca (Spanish pronunciation: [aˈʎaka], [aˈʝaka]; alt. spelling, hayaca and ayaca) is corn dough stuffed with a stew of beef, pork, and chicken, fish or other seafoods in some places, and it is "adorned" with raisins, capers, olives and wedges of fowl meat. Like some Mexican tamales it is folded in plantain leaves, tied with strings, and boiled. It is typically served in Christmas season and has several regional variants in Venezuela. It has been described as a national dish of Venezuela. There are versions of this dish throughout the Caribbean. In the Dominican Republic, known as tamal or guanimos it is made with cornflour stuffed with ground meat; in Trinidad and Tobago, it is known as pastels, as in Puerto Rico, known as "pastel" and made with a green plantain or boniato dough. A characteristic of the hallaca is the delicate corn dough made with consommé or broth and pork fat (manteca) colored with annatto or "onto". Ayaca are also commonly consumed in eastern Cuba. The most likely progenitor of the maize body and plantain envelope of hallaca is the Mesoamerican tamal. Tamal-like dishes, under various names, spread throughout the Spanish kingdoms in America as far south as Argentina in the decades following the conquest. According to Adolfo Ernst, the word hallaca evolved from the indigenous Guarani language, stemming from the verb ayua or ayuar, meaning "to mix or blend". From there, the construction ayuaca (mixed things) devolved to ayaca and ultimately to hayaca or hallaca (using Spanish silent "h" when written). Another version presumes that the word comes from an aboriginal language of the West of the country, whose meaning is "wrapping" or "bojote".The earliest use of the word in the modern sense is in a 1781 document of Italian missionary linguist Filippo Salvatore Gilii. 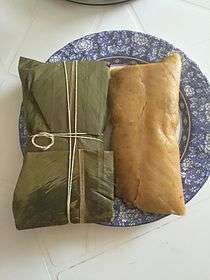 A prepared hallaca. Wrapped inside the banana leaves and cooked, without the leaves ready to be served. Hallaca is a staple part of Venezuelan Christmas celebrations and its preparation is practically limited to that time of the year. The dish is also an icon of Venezuelan multicultural heritage, as its preparation includes European ingredients (such as raisins, almonds and olives), indigenous ingredients (corn meal colored with annatto seeds and onions), and African ingredients (smoked plantain leaves used for wrapping). Trinidad, which is just 7 miles from Venezuela's east coast hallacas are called pastelle. The preparation is essentially the same with some variation in size and the filling. One of the major herbs in Trinidadian cooking is culantro (called chadon beni locally) and this is a predominant flavour in most seasoned meat. There are also vegetarian fillings made from soya, lentils and various other things to cater to Hindus and other vegetarians. The typical Trinidadian pastelle is generally a lot smaller than its Venezuelan kin. In Aruba and Curaçao, two islands just off the coast of Falcón state, Venezuela, it is called 'ayaca' or 'ayaka'. The ingredients are pork and chicken stew, or pork or chicken stew, capers, raisins, cashews, bellpepper, pickled baby onions, prunes, and olives. The dough is made from white cornmeal, and the ayaca leaves first spread with lard or oil. Cooked meat and other ingredients are then wrapped in ayaca leaves, tied with string and then boiled for about 2 hours. Flavors in the ayaca vary from family to family, and some add madam Jeanet peppers (very hot). Probably it came to the island by immigrants, or the recipe was borrowed. Like many things from other cultures, it has become a part of the Aruban and Curaçaoan Christmas food traditions adopted as in Trinidad. In Puerto Rico, although it is almost a lost tradition, the hayaca or hallaca used to be a popular part of the local gastronomy. It is commonly acknowledged, that the name most definitely came from indigenous backgrounds. However, even the locals have a hard time distinguishing the hayaca, from the "alcapurria", "guanimes", "pasteles" and some also call them "empanadas", since they are visually, very similar. In simple terms, the hayaca from Puerto Rico is not made with corn nor fried, boiled or steamed. It is baked, traditionally, in open-wood-fire to a smokey and toasted outer layer. Different from other cultures, the unique mix of ingredients like the cassava, milk, annatto, banana leaf and interesting style of open-wood-fire cooking, only allows to think that this local version might have been introduced by a combination of the Taíno tribes and either African slaves or Spaniards during the Spanish colonization. Because of the long and elaborate process and skills that takes to prepare, the hayaca is now rarely available but still found, mostly in coastal, family-owned restaurants and other small establishments known as "kioscos" where there are still strong ties to native heritage and classic slow cooking skills. Fillings set out prior to hallaca making. Hallacas are one of the most common traditions during Venezuelan Christmas. Filling of the Hallaca before being wrapped in the banana leaves. The traditional hallaca is made by extending a plantain leaf, greasing it with a spoonful of annatto-colored cooking oil and spreading on it a round portion of corn dough (roughly 30 cm), which is then sprinkled with various fillings. While no two families make hallacas in quite the same way, the most common fillings include a mix of stewed (or rare) meats (pork, poultry, beef, lard, crisp or pork rind), raisins and pitted green olives. Pepper-filled olives are becoming more popular nowadays. People in Los Llanos add boiled eggs and pieces of red pepper. Others might add chickpeas, nuts and almonds. The filled dough is then skillfully wrapped in an oblong fashion and tied with string in a typical square mesh before its cooking in boiling water. Afterwards, it is picked from the pail with a fork, unwrapped and served on its own plantain leaves with chicken salad, pan de jamón (ham filled bread) or plain bread. In the Andean region, the filling is cooked with the rest of the hallaca, while in the rest of the country it is usually cooked beforehand. The ideal hallaca has a silky golden-reddish glow. In taste, it aims to balance the saltiness of the meats and olives with the sweetness of the raisins and of the dough itself. After making a number of hallacas, the remaining portion of ingredients is occasionally mixed together in order to obtain a uniform dough. The dough undergoes the same hallaca wrap and cooking preparation, although typically smaller in size and much fewer in number. The result is the bollo, which may be offered as a lighter option to the hallaca at breakfast, lunch, or dinner. After cooking, hallacas can be frozen for several weeks with no change in flavor. It not unusual for some families to eat hallacas as late as May or June of the next year. Ingredients differ from region to region and from family to family. It is not uncommon to find hallacas with chickpeas, tomato, bell pepper, pickled vegetables, and garlic. Potatoes are included in the Andean variation. Also, some of the traditional ingredients may be substituted by local variants such as fish and lobster (East Coast) and plantain dough (Maracaibo). Hallaca-making requires many hours of intense work, so hallacas are typically made all in one go, in large enough quantities to last the entire holiday season (from a few dozen to several hundred). Hallaca making is a logistical feat and an economic stretch for many. The most important Venezuelan newspapers usually carry stories in their Economics sections at the beginning of December noting the rise in the cost of making hallacas. Hallaca-making reunites family members at holiday time. It is a job joyfully done by whole families together, marking the start of the holiday festivities. However, the most important part of "hallaca-preparation" is that it represents one of the strongest holiday family traditions in Venezuela, comparable perhaps to Thanksgiving in United States. The hallaca making party tends to be matriarchal, with grandmothers and/or mothers leading the preparation. Foreigners in Venezuela in December are often struck by how often they are offered hallacas. Friendly rivalry over whose hallacas are the best is part of the Venezuelan holiday culture, leading to the popular saying la mejor hallaca es la que hace mi mamá – the best hallaca is the one my mother makes – an expression of familism. This expression was immortalized in a holiday song by Venezuelan pop singer Raquel Castaño. Wikimedia Commons has media related to Hallacas. 1 2 Kijac, M.B. (2003). The South American Table: The Flavor and Soul of Authentic Home Cooking from Patagonia to Rio de Janeiro, with 450 Recipes. NYM Series. Harvard Common Press. p. 84. ISBN 978-1-55832-249-3. Retrieved November 5, 2016. ↑ Albala, K. (2011). Food Cultures of the World Encyclopedia. Food Cultures of the World Encyclopedia. Greenwood. p. 1-PA102. ISBN 978-0-313-37626-9. Retrieved November 5, 2016. ↑ Garth, Hanna 2013 Food and Identity in the Caribbean. London: Bloomsbury. ↑ Schuetz, K. (2009). Venezuela. Exploring Countries. Bellwether Media. p. 23. ISBN 978-1-61211-587-0. Retrieved November 5, 2016. ^ Rosenblat, Ángel. (Venezuela Analysis, ???). hallaca.asp "hallaca". Retrieved 9 January 2005.